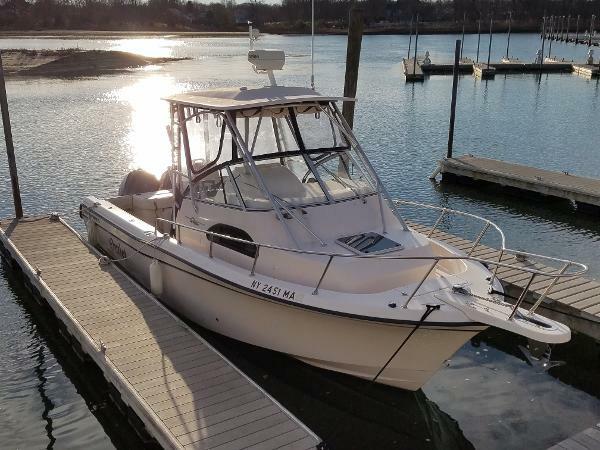 2005 Grady-White Sailfish 282 2005 Grady White 282 Sailfish Powered by Twin 2005 Yamaha F225 Four-Stroke Outboards With 559/758 Hours. Bow Pulpit w/Anchor Windlass, Hydraulic Trim tabs, 40 Gal Livewell, Raw Water Washdown, Cockpit Shower, Cockpit Bolsters, Shorepower w/Cable, Electric marine Head, HW Heater, Refrigerator, Single Burner Stove (Butane), Microwave, Cabin Sink, Transom Door, Newer Curtains Including Rear Drop Curtain, Stereo CD Player, Cabin TV w/DVD Player, Twin Raymarine C80 Units With Radar, GPS & Plotter. Standard Horizon VHF Radio. Very Nice Package Ready for a New Owner! 2001 Grady-White Sailfish 282 Since being introduced in 1959, Grady-White Boats have remained proudly known for their exceptional attention to detail, heritage, design integrity, award-winning performance, inspired workforce & impassioned leaders, exceptional customer support & overall ability to provide a better boating experience for their owners. Along with being awarded highest customer satisfaction, safety, quality, and reliability, Grady Whites SeaV2 hull performance has ranked #1 in each of the eight J.D. Power & Associates Marine Studies ever done! Designed exclusively for Grady White by the originator of the "modified vee" hull design, the continuously variable vee keel dead rise sharpens from the transom (20 degree) to the bow stem (50 degree) delivering a soft & dry "deep vee" ride quality while maintaining the fuel efficiency of a "modified vee" when underway, stability when at rest & is described to track as if the boat were on rails. "The sea does not compromise. Nor should you". 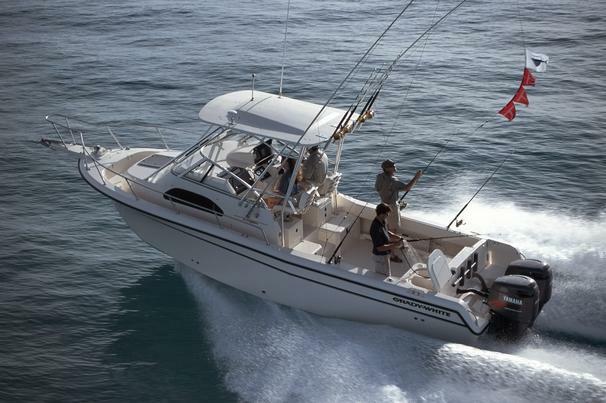 The 282 Sailfish, formally known as the 272 Sailfish, was designed to accommodate boaters with plans of offshore fishing, pleasure cruising & overnighting. Her cockpit is spacious, uncluttered & features conveniently located fishing amenities including an insulated livewell, fish boxes, fresh & raw water wash downs, a transom bait prep station & plenty of rod holders/storage as well as easily accessible outriggers. When seating is a concern, cushions snap into place on the foredeck, behind the captains chairs & on the molded center AFT bench seat while padded bolsters wrap the entire cockpit for added comfort. The fiberglass hardtop offers plenty of shade & the stow-able 4-sided isinglass enclosure takes minutes to secure when additional protection is needed. Her lockable, air-conditioned 3 berth cabin incorporates a galley with refrigerator, butane stove & freshwater sink as well as a fully enclosed head with holding tank, macerator & pump-out. Powered with twin Yamaha 250 HP Saltwater Series II outboards, the 282 Sailfish gets 1.4 MPG at 3800 RPM's cruising comfortably at 40 MPH & reaches a top speed of about 50 MPH at wide open throttle. 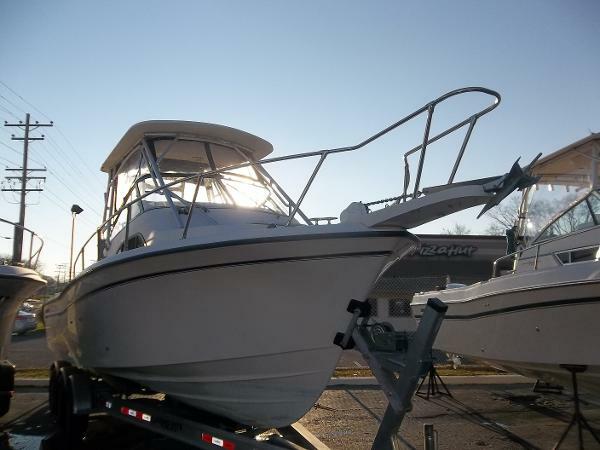 2007 Grady-White Sailfish 282 Low hours, detailed and a brand new trailer included! Twin 250 Yamahas get you to the fish! 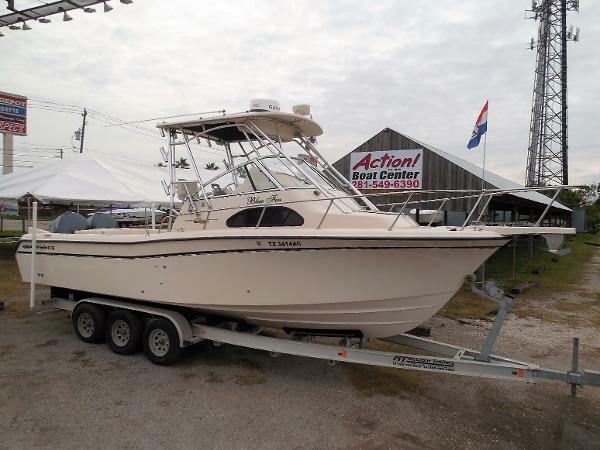 Just serviced and detailed, this Grady White 282 Sailfish is turn key and just ready to get out there to fish. 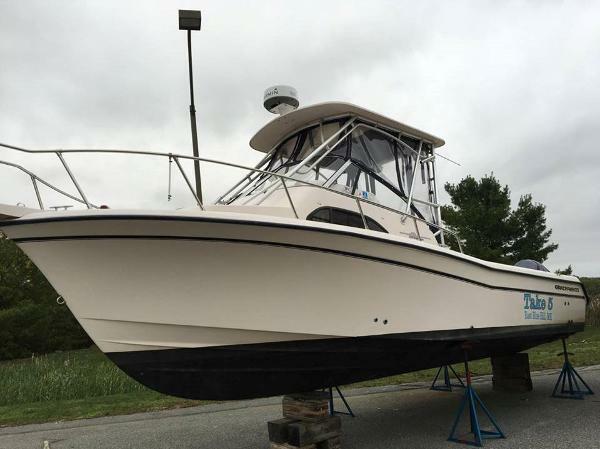 Garmin touchscreen GPS, Raymarine radar and integrated fish Finder, Simrad auto pilot, twin VHF, 2 live wells, raw water was down, fresh water rinse, dive ladder, new Air conditioning unit, stove top, refrigerator, TV, dvd, taco outriggers, Lewmar anchor wench and a brand new 2016 Float On dual axel trailer. 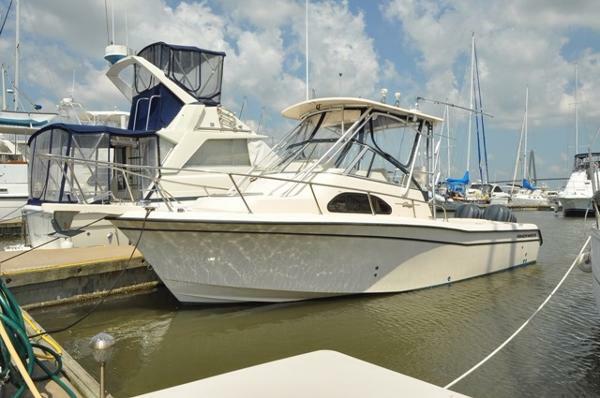 2008 Grady-White Sailfish 282 Super Clean 2008 Grady White 282 Sailfish. This Excellent Riding Walk Around Has Fantastic Visibility From The Helm And Is A Snap To Dock With It's Installed Bow Thruster. 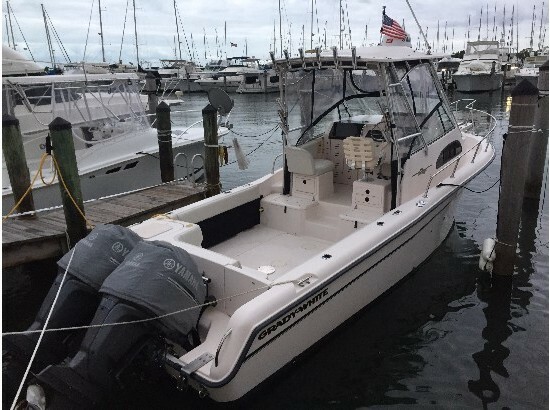 Other Options Include Garmin 4212, Garmin HD Radar, Simrad Autopilot, Hard-Top, Full Enclosure Canvas,Companion Bench Seat, Kenwood Stereo, Air Conditioning, Flat Screen TV/DVD ,Outriggers, Anchor Windlass, Powered By Twin Yamaha F250TXR Four Strokes With 386 Hours On The Boat. Call Or Stop By Today For A Showing. We Are Open 7 Days For Your Convenience. 2005 Grady-White Sailfish 282 This is a very nice clean 2005 Grady White 282 Sailfish. It is powered by Yamaha F225 Four Strokes that have 1500 hours on them. They have had the update kits and have been regularly serviced. They run great and have a life expectancy of 3000-5000 hours per Yamaha Motor Corp. There is no trailer, but new ones run around $5000-6000. Options on the boat include: Deluxe Helm Chairs, (std chairs also included), Taco Outriggers, Shore Power Package with Battery Charger, Microwave and Water Heater, Head with Deck Pumpout and Holding Tank, Windlass, TV/DVD Player, Raw Water Washdown, Trim Tabs, Livewell and Freshwater Washdown. Electronics on the boat include: Garmin 3006 GPS, Furuno FCV 5823 Bottom Machine, VHF Radio, Simrad Autopilot and Stereo. Call today for more information or to schedule a showing. Click on full specs for high resolution pictures. 2004 Grady-White Sailfish 282 Watch our very informative 5 minute video of this boat running - in the water on a plane - in the Photo Gallery at our website! 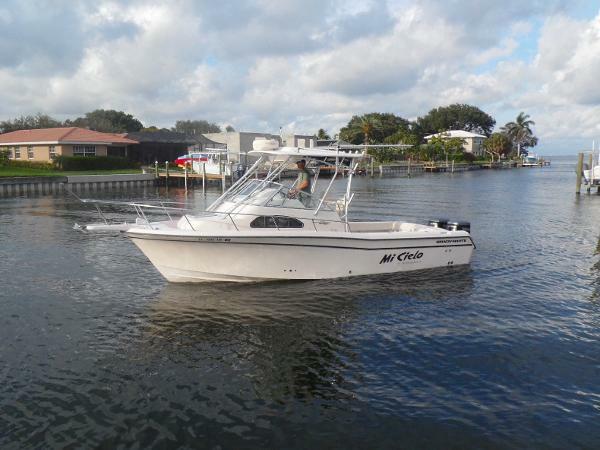 This 2004 Grady White 282 Sailfish is powered by twin 225hp Yamaha four stoke motors. Total boat hours are 406 (that is an average of just 37 hours per year) with the port engine power head replaced in 2015. This beauty comes with full canvas enclosure, bow pulpit with anchor windless, stainless props, swim platform, upgraded Grady ladder back captain chairs, dockside power with hot water heater, enclosed head with shower, galley with stove and pressure water, live well, VHF radio, tilt steering wheel, the famous SeaV2 hull design (of course), dual fuel cells, stereo, hardtop, spreader lights, rod holders, raw water wash down, sleeps four - and loaded with other options just too numerous to list... This is the one every fisherman and family member dreams about - she can do it all! 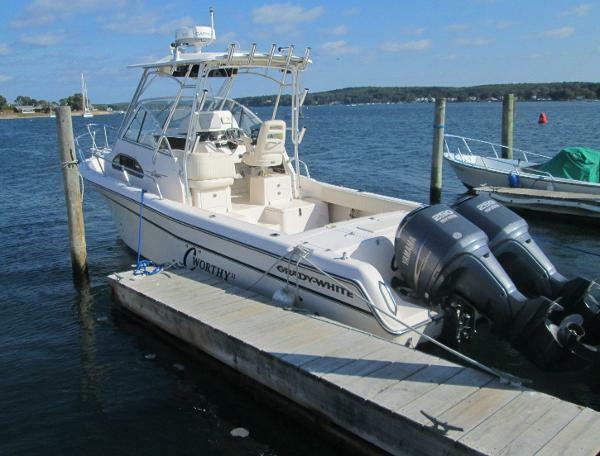 We always sell boats for less and this one is going to shock you! Stay tuned for our price, pictures and video of her running wide open in the water at 41mph !!! That's quick for a 28' fishing machine. Remember - we sell boats for less - guaranteed! We do take trades and we also finance!! Watch our video in the Photo Gallery! Attention Overseas Customers: We Provide Free Delivery To The Port Of Baltimore. 2006 Grady-White Sailfish 282 The Grady-White Sailfish 282 is a 28 ft. walk around not counting the bow pulpit. it is a True self bailing boat where all fish boxes and livewell drain overboard and no fish boxes in the floor that need to be pumped out. This model is well know for it's dry and soft ride in open ocean conditions. It features a deluxe cabin with 2 sleeping areas, enclosed head, shore power, microwave, fridge, water heater and cabin rod racks. Trailer is not included. 2008 Grady-White Sailfish 282 This 2008 28' Grady White is absolutely laid-out to FISH. The raised helm set-up includes dual Pompanette chairs a Seastar hydraulic tilt wheel, stereo access at the dash, an electronics lock box above the wheel and dual overhead lock box storage. Life jacket stowage is directly above the helm chairs for easy and out of the way access. The simple, yet fine, interior features a galley to port, with Corian countertops, a hide-away Kenyon single burner stove, a microwave, refrigerator and stainless steel sink. There is storage at the counter and the Kenwood CD player/Sirius ready stereo sits right above it. Teak and holly floors will make you forget that this is solely a fishing boat, as well as hot water availability. Remove the table and get some rest in your V-berth after a long day reeling in fish. Guests can rest their eyes in the mid-berth. The fully enclosed head can be found in the center of the cabin, to starboard. You will find a Jabsco marine toilet, sink with hot/cold water, a shower wand, storage and a mirror on the door. Back to fishing: the bait tank sits center in the cockpit, leaving plenty of walk around room to rig your gear and fish. The transom settee conveniently folds up to create more deck space. A 251 quart, insulated fish box is at the transom with an attached cutting board. To port on the transom is additional storage. To port, below the guest helm chair is a 40 gallon live well and another storage compartment sits above that. 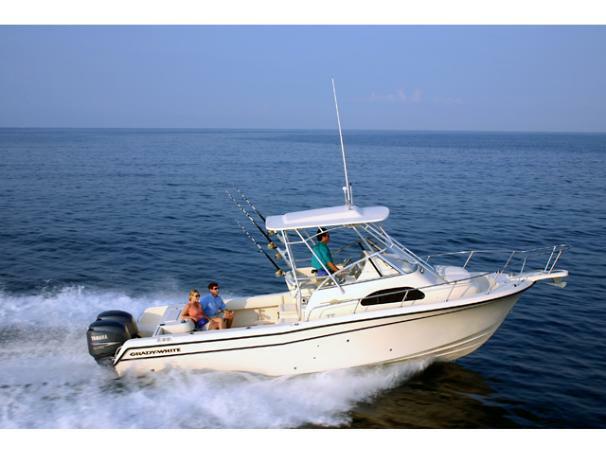 To starboard, is a 166 quart fish box, with dual, built-in tackle boxes above. Under gunnel storage to port and to starboard, as well as 4-flush mounted rod holders and 9 stainless steel rocket launchers will keep all of your fishing equipment within reach. 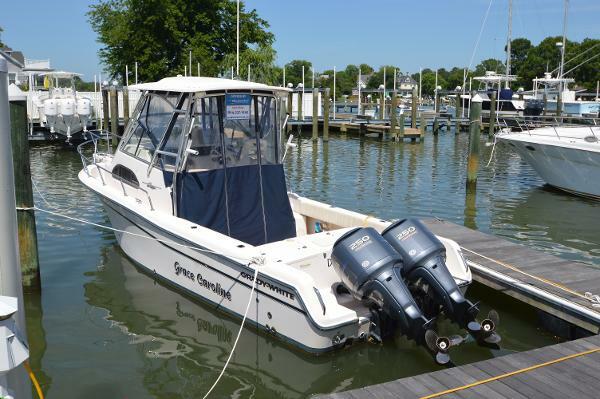 Twin 250 hp Yamaha 4-strokes will give you the power you need to mitigate the sea and arrive at your favorite fishing spots with ease. Dorado, Marlin and Tuna are awaiting your arrival on this 2008 28' Grady White Sailfish!